Tannyr is a licensed Broker, who brings a strategic and personable approach to all aspects of real estate transactions. Tannyr earned her Bachelor of the Arts degree in Psychology from the University of Wyoming, which provides her with a thorough grasp of her clients’ wants and needs for their purchase or sale. 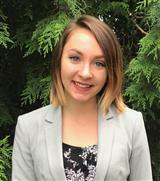 In addition to her education, Tannyr also has an extensive background in many aspects of real estate. Throughout college, Tannyr worked at Summit Title Services in Laramie, WY, where she spent four years as an Escrow Assistant and Title Researcher. This experience gives her a great deal of knowledge about all closing documents presented by the title companies, as well as the closing process. In 2014, Tannyr moved to Portland with her husband, Ethan, and has spent the past three years as the Office Manager at Alliance Properties, managing the day-to-day activities of properties in the Portland Metro Area. In her spare time, she takes advantage of the beauty that the Pacific Northwest has to offer through snowboarding, hiking and running, as well as enjoying the wonderful food and activities within Portland. This understanding of the area, along with her background in many aspects of real estate allows Tannyr to help her clients through their real estate transactions with the utmost understanding and expertise.